We are excited to announce a generous grant from Dining for Women, a global giving circle dedicated to transforming lives and eradicating poverty among women and girls in the developing word. The funding from Dining for Women will provide social and economic empowerment opportunities to low-literacy, Quechua-speaking women in the communities we serve. Eight community health workers will receive advanced training to become health worker trainers (docentes) in nutrition. These women will go on to provide nutrition education to 30 community health workers, who will then share their knowledge with people in their communities. In rural Peru, women typically decide which foods to feed their families. By learning and sharing knowledge of balanced nutrition, our health workers will empower other local women to make the best possible nutrition choices in the context of challenging economic and agricultural conditions. Making the best possible food choices will reduce rates of anemia and other malnutrition-related health challenges in the high-poverty rural communities of the Sacred Valley. Better food means better health for everyone. Thank you, Dining for Women! Check out our video with Dining for Women here. 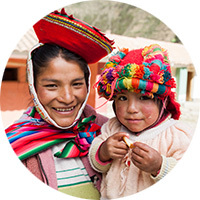 Find ways to stay engaged and support Sacred Valley Health!